Uncle Seymour doesn’t actually exist—at least, not in the conventional sense of the world. He’s the creation of Mark Sainsbury and Michael Benyan, founders of the Zetter Group of hotels and restaurants. 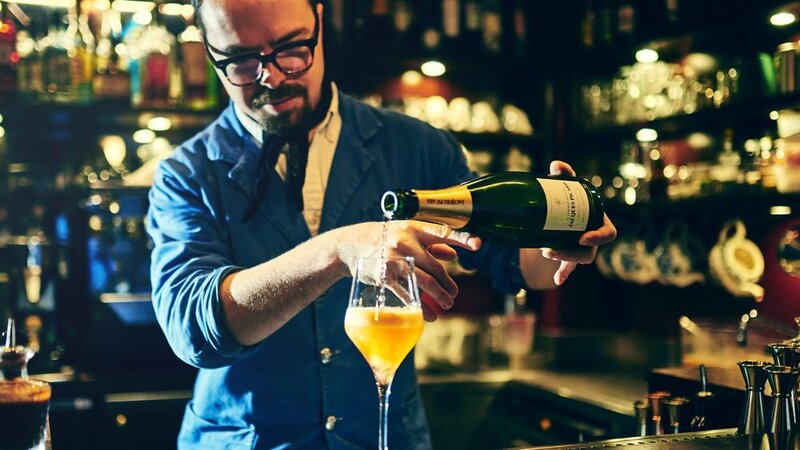 He’s a “friendly, roguish figure who went on the Grand Tour of Europe and came back with loads of collectables,” explains Mark, and his ‘parlour’ is in fact the bar of The Zetter Townhouse in Marylebone. “We created his story to help feed the look and feel of the place, just as we did when designing our Clerkenwell Zetter,” he says. There, it was Great Aunt Wilhelmina who painted the picture. “We had an image of her: a spinster with a windswept look and a glint in her eye, and whenever we were grappling with a design decision we’d ask, ‘What would Wilhelmina do?’” Mark recalls, laughing. “What started out as a joke became a lovely design touchstone for me and Russell”—Russell Sage being the magician behind the Zetter hotels’ inspiring interior design. It was Russell who recalled the real-life equivalent of Uncle Seymour, Sir John Soane, and the 18th century museum that was once the house of this architect and noted collector. “Russell Sage Studios had worked with us on several projects, so there was a really close connection and understanding of what our brand stood for and how obsessive we get on certain details.” Based in Holborn, the Sir John Soane’s museum, filled with antiquities, furniture, sculptures, architectural models and paintings, is an extraordinary testament to Soanes’ inimitable aesthetic and pathological penchant for collecting. Soanes was Uncle Seymour’s spiritual forefather, and anyone who has been to his house will spot the inspiration behind Russell’s lustrous palette, antique furniture and Hogarth-esque paintings. This idea of the rule book—or, rather, a lack of one—crops up again in my conversation with Nikolai, the bar manager. It’s an hour or so before the after-work crowd arrives, but I assume the sun is over whatever the yardarm is, so enjoy one of Uncle Seymour’s signature cocktails: Le Sphinx. “To have a champagne cocktail on the rocks is very unusual,” explains Nikolai, as the iridescent, burnt orange drink arrives, clinking gently. “But this is probably the best champagne drink I have had. It is so fresh.” It’s an orchestra of flavours, with the sweet, zesty honey, the musky florals of the ambrette bitter, and the champagne sounding a bubbly, biscuity base note. Nikolai cut his bartending teeth at the three-Michelin starred DiverXO in Madrid, and the chef there—king of culinary controversy David Muñoz—shaped him profoundly. “David had this incredible library of flavours in his head, and he cared as much about balancing the drinks as the dishes.” Learn the rules, David instructed Nikolai, and then forget them. “They will only limit you, he told me. Now in my thinking I consider a huge range of ingredients and techniques.” At DiverXO, and then StreetXO, where Nikolai moved when David opened his outpost in Mayfair, “we spent more time in the kitchen than in the bar. We were always trying and testing: using the wok, using the robata, drying and salting things.” No easy task master, David would push them to the furthest edges of their imagination, at one point demanding “a peking duck cocktail. A cocktail that tasted like a peking duck.” Did you succeed, I ask, wide-eyed? “It took me two years,” Nikolai replies proudly. One of the things he likes about Seymour’s Parlour is the relative simplicity of the drinks—“refined, not too much noise, just a concentration of flavour”—and the infrequency with which the menu is changed. “David would ask every day, what have you got to show me? He wanted new drinks all the time, but creativity doesn’t work like that. It can take me two minutes or two years to create a new drink.” Every six months—spring and then autumn—Nikolai and his bar team will reveal a new menu of cocktails they’ve tried out on Mark, Michael and the odd lucky customer. “We are a rare species, bartenders: we like boozy, bitter, strong flavours, so we need guest feedback,” he laughs. Every new drink is a coming together of tools and materials, and a carving out of an essence and shape. Which brings us back to Uncle Seymour and the ‘authentic fiction’ that, remarkably, has managed to rise above the London food world’s cacophony of ‘concepts’. These drinks are seriously sophisticated—the tinctures and infusions prepared on site with meticulous craftsmanship, their creation months in the making—so the deliberate nod in their title or presentation to Uncle Seymour’s exploits is easy to forgive. For example, you wouldn’t know unless you asked the staff, but the Rake cocktail is inspired by a series of William Hogarth paintings in the John Soanes’s Museum called A Rake’s Progress, which depicts the descent of Tom Rakewell into licentiousness. “The orris root in the cocktail is what women back then would have used on their faces. We put white colourant in to make it white, and the juniper oil creates a black dot like a beauty spot.” The Turf Club, a potent blend of Old Tom gin, Dubonnet, Peruvian bitters and a grass essence recalls Seymour’s love of horseracing. Far from confining his creative reach, Nikolai finds great pleasure in embellishing the Seymour storyline through the ingredients and serve of his drinks. Of course, this thirst-quenching fiction only works because it doesn’t detract from the art and science of the cocktails. Nikolai opens his iPad and guides me through what could be an intricate tube map, were the lines called champagne-style or gimlet, their stations orange blossom or gin and their termini a range of weird and wonderful drinks. “We start with the type of cocktail we are going to make. Then we move to the spirit, then the many hundreds and hundreds of ingredients.” Only once the cocktail is complete with all three elements and they are happy with how it fits into the menu do they alight on the name and story behind the drink. Years later, when he thought of bringing Zetter west, he remembered that “Marylebone feeling”. “We loved the street, the townhouse—once Edward Lear’s house—the mix of clientele. In our landlords, The Portman Estate, we found people who shared our excitement.” It was a partnership, he says, and the more it became apparent that the development would take longer than had been anticipated, the more important was their faith in Uncle Seymour’s story. At the start, Mark imagined someone like Uncle Seymour living in Marylebone, Russell imagined his parlour, and now, in 2019, Nikolai is imagining his cocktails.